Attached is the December 2014 Lectionary Life App from Anglicans for Life. The Lectionary Life App includes devotional reflections based on the Lectionary Readings for the time period. This Life App readings are based on the Sundays in Advent and December. I wrote these reflections to bring out the themes in the readings related to the Sanctity of Life. You can subscribe to the Lectionary Life App here. Fill in the contact form and request the Lectionary Life App subscription. Heavenly Father, glorify your name in our lives and keep us blameless on the day of our Lord Jesus Christ. Lord, grant us alertness and sober mindedness that we will not be deceived or fall into temptation. Grant us wisdom and revelation to know Jesus and to hold onto his name and word in the midst of the trials of life. May your perfect love enfold us that we would not fall into fear. May your perfect peace guard our hearts and minds in the midst of the world’s troubles. Keep our hearts warm with your light and love even as the world turns cold. Ignite and enflame our hearts and make them all fire for love of you. Help us to remain steadfast in our faith even against persecution and oppression. God, help us to hold out the gospel of the kingdom to the world, even to our enemies who hate us and revile us, to the apathetic and deceived. Let us be light in the darkness. Give us understanding of your will and the courage to keep it. We ask for your mercy and grace and the manifestation of your salvation in our lives. Almighty God, may your kingdom come into our lives and establish us as ambassadors of Christ. Help us to walk in his authority to preach the gospel, to heal the sick and cast out demons. May we be vessels of peace and bring freedom wherever we go. Holy Spirit empower us, clothe us and place your words in our mouths that we might be effective witnesses to Jesus. Grant us words and wisdom that none of our adversaries will be able to resist or contradict. Lead and guide us as your children. O Creator of all things, we ask for your abundant provision for us and for all of your children. 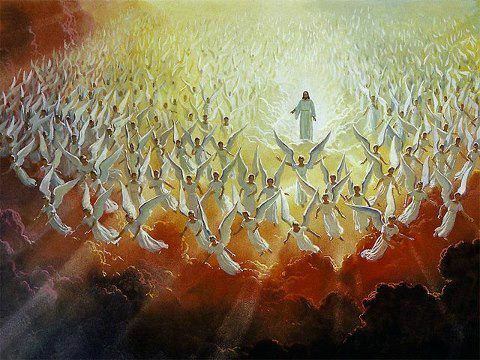 Lord of Hosts, we pray that you send your heavenly angels with power into our lives for the sake of your Name. Commission your angels on our behalf and on behalf of your church worldwide, especially for those who suffer persecution and are in great need. Empower your angels against the spiritual forces of darkness in high and low places. We ask you to bind and rebuke the enemy of the kingdom of heaven. Father, help us to turn our eyes heavenward and to seek Jesus who is the author and perfecter of our faith. May we seek your kingdom and righteousness first above all else. Lead us in holiness and truth and prevent us from being weighed down by anxiety, dissipation or weariness. Grant us the power and initiative to say “No” to ungodliness and sin. Help us to speak the truth in love and to rebuke sin in ourselves and others. Encourage us and strengthen us to work heartily for you and others and not to grow weary in well doing. Help us, O Lord, to keep watch, fully awake, as faithful guardians. Help us to serve you, our Master, faithfully in love and obedience. Help us to stand firm that we might gain life everlasting. Fulfill your purpose in our lives, Lord, for your love endures forever. May we be ready at the return of the Lord. Come, Lord Jesus. Amen.